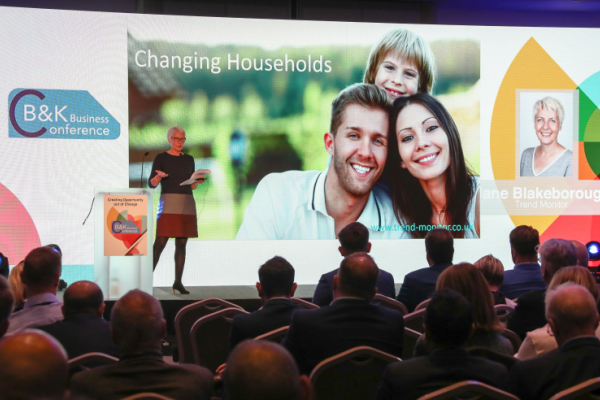 The theme for this year’s Bathroom Manufacturers Association Annual Conference was ‘Turning Change into Opportunity’ and our research director Jane Blakeborough was one of the keynote speakers at this conference in October. Tackling the wide-ranging subject of trends that will shape the future of the KBB industry, Jane highlighted how global mega-trends are changing our housing requirements, how developing demographic trends are changing our household structure and by necessity we way we use our homes is changing. She also demonstrated how consumer trends are changing how we purchase products for our homes. Quick to point out that it is not the trends themselves that will shape the future of the industry, rather it is how businesses react to the changes in consumer behaviours brought about by these trends, Jane ended with an example of how ‘Wellness‘ has developed into a major consumer trend as a reaction to the bigger trends that are happening around us.